Permissions: Who Can Do What? Should You Be an Admin? 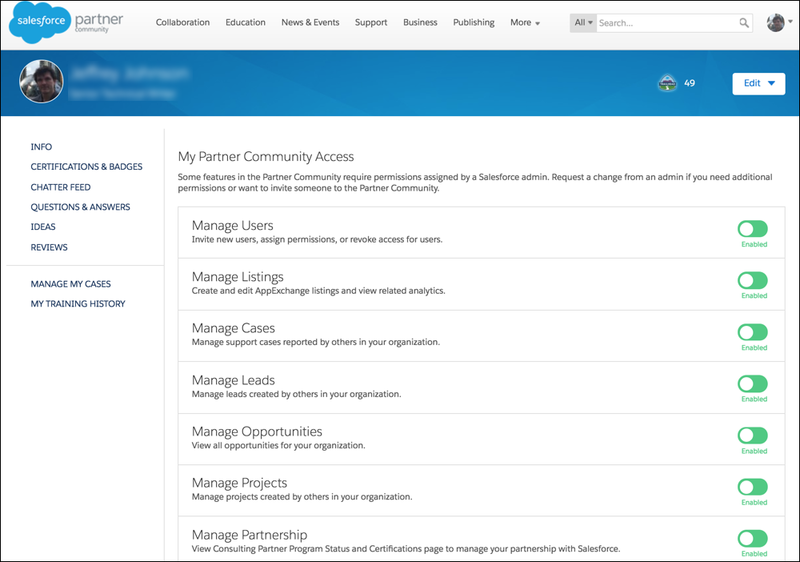 Explain how to add a user to the Salesforce Partner Community. Define the permissions that determine how your employees can access or modify data. 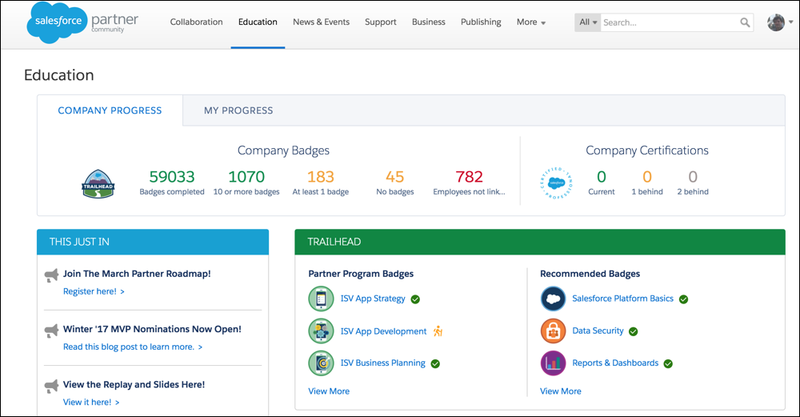 Describe how to track employee progress on Partner Value Score, certifications, and Trailhead badges. Someone on your business team is in charge of getting your team into the Salesforce Partner Community and giving everyone access to resources. Are you that person? If so, read on! Here we show you how to add and manage users on your team. Even if you’re not the admin for your team, keep reading. The material here benefits you whether you’re giving or requesting access to a resource. And you’ve still got to take the quiz at the end. How do you know whether you’re an admin? If you're the first person in your company to create an account in the Salesforce Partner Community, you’re it. Aside from that, admins have a Manage Users option under the More tab on their Salesforce Partner Community dashboard. From anywhere in the Salesforce Partner Community, click your picture at the top right. 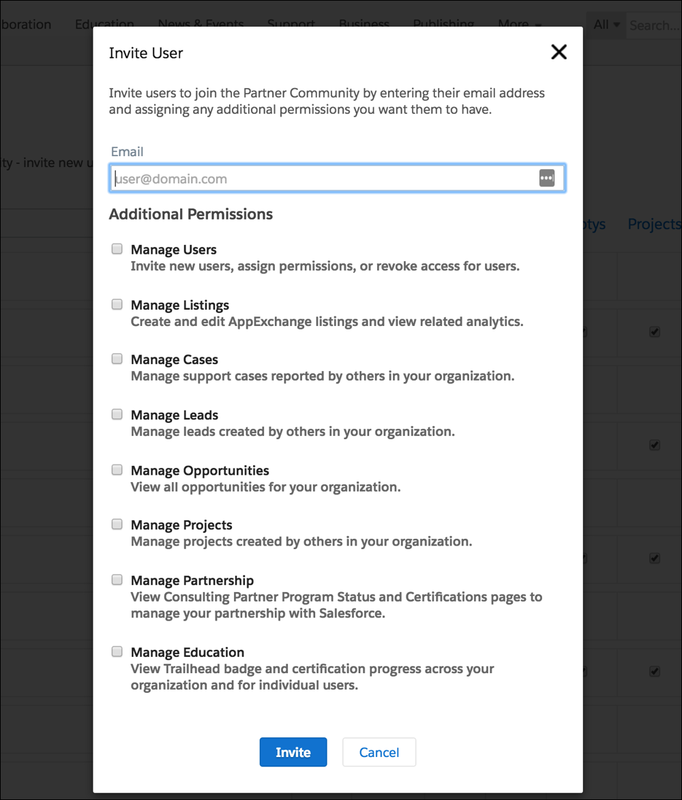 While we’re here, let’s discuss the kinds of permissions available to users in the Salesforce Partner Community. Each of these permissions allows you to do certain things. Each permission has a short description below its name on your Partner Community Access Page. If Manage Users is enabled for you, you’re an admin. 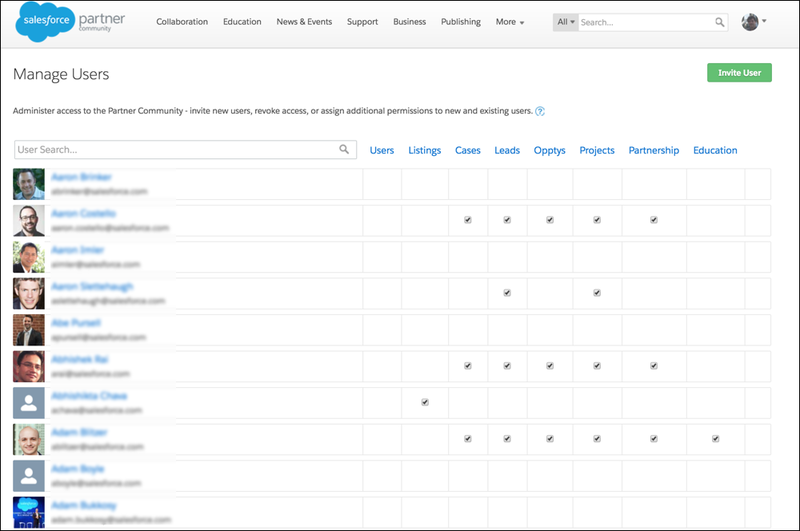 Add new users in the Salesforce Partner Community? Grant specific permissions to your company’s employees? Download your company’s business data from the Salesforce Partner Community? Click the switch next to the permission you want. A window pops up with a list of admins who can grant it for you. Select one of these admins and click Contact to send the admin a message requesting the permission. The admin you contact will let you know when your permission has been changed. On the Manage Users tab, click Invite User on the top right. Enter the email address of the user you want to add, and then set this user’s permissions appropriately. To change the permissions for an existing user on your team, go to that user's entry on the Manage Users page. Check or uncheck the boxes for the permissions you want to change. Visibility is everything when you’re managing a business. If you can tell what you’re doing right and what you need to improve, you can respond appropriately. Let’s talk about how to keep track of what you and your team are up to. The Salesforce platform gives you a great head start in your business. The more you know about it, the more you can use it effectively. Training your staff is vital to the success of your business. You know you can track your own Trailhead training and certification on the Education tab. If you have the Manage Education permission, the Education tab has a section called Company Progress. This section shows you the progress your colleagues are making on Trailhead and on their certifications. Click any of these numbers to view a report with more detailed information, including Trailhead badges your colleagues are working on. Use this information to encourage your team to connect their Trailhead accounts and hit those trails! Clicking these numbers generates a more detailed report showing the specific certifications on which employees are current and behind. If you’re an admin, these certification numbers also show up on your Business tab. 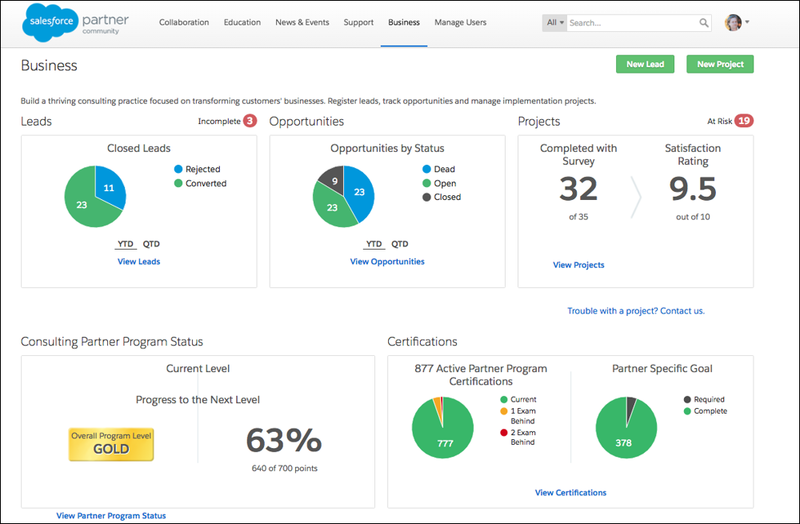 If you’re a consulting partner, your relationship with Salesforce is affected by your Partnership Value Score (PVS). This score measures your activity against targets in several categories. We don’t go into detail about your PVS right now—it’s explained in our Consulting Partner Basics module and in the consulting partner program guide. But it is important to track your PVS, because it determines the level of resources and discounts available to you. If you’re an admin, your PVS appears on the Business tab, along with links you can click to see how to improve it. For admins, the Business tab is a comprehensive dashboard showing your company’s activity. On the Business tab you can see your own leads and opportunities whether or not you’re an admin. If you’re an admin, you can see all of your company’s leads and opportunities, along with a record of any recent related activities. To the left of the recent activities feed, there's a list of any actions you need to take as an admin. This concludes our introduction to the Salesforce Partner Community. At this point, you’ve got everything you need to log in and get your hands dirty. If you haven’t already, check out the AppExchange Partner Basics or Consulting Partner Basics Trailhead modules. They explain the specifics of these partnerships with Salesforce. But your next step is to log in and spend some time on the Salesforce Partner Community. There’s no substitute for experience. We look forward to seeing you there, and we’re excited to work with you.